A Natural Cure – Hey, Look! A Writer Fellow! I saw what you did to that cat and, well, I just wanted to thank you. I also want a peanut. I love the idea of sitting in an Adirondack chair on a sunny day with a pad and a pen. There’s something so romantic, so wonderful about writing in nature. So, once in a while, I give it a try. And then the pollen goes up my nose. And the bugs bite. And the sun get too hot and my hands get sweaty, and, since I’m a lefty, I smear the ink with my sweaty hand – which is not such a big deal because I’m not writing anything worth keeping anyway, because every time a leaf crinkles, I look up in eager anticipation of finding that feral cat that I oh, so wanna hit with a rock because NO ONE menaces my squirrels without hearing from me, buddy! So I guess what I’m saying is that, when I try to write in it, nature distracts and annoys me. Otherwise nature and I have no real problems. It often delights me. When the weather is right, I could stand around in nature all day interacting with it in the most genial and stupid ways. For example, the other day I caught myself waving at a squirrel. He didn’t wave back – that would be asking too much, I suppose – but he did seem to take the gesture in the spirit in which it was given and that pleased me no end. Better still, I have discoverd that actions such as these improve my writing. I have the bad habit of chaining myself to my desk. Even when my brain refuses to work, I stay put. In general this could be defined as good self-discipline. You can’t just sit around and wait for the muse, after all. It never shows up when you want it to. Since the words aren’t going to write themselves, I muscle through. But every writer reaches a point when good self-discipline evolves into something that looks a whole lot more like masochism. Nothing’s gonna come no matter how hard you try. So I pry myself away and tell myself it’s not procrastination if I deliver myself back to the desk eventually. Then I take a walk and wave at squirrels. Doing so restores my overall sense of well-being. It provides the second wind I need to get back to my awful, awful writing and make something that at least resembles progress. Better yet, such a walk allows me to pursue my new hobby: feral cat chasing. In the grand scheme of things, saving a squirrel is always more important than a well-written paragraph. I think you should have T-Shirts printed with ‘Saving a squirrel is always more important than a well-written paragraph’ printed on them. It will be something that people will quote from you in the future, trust me. People will read greater meaning into it than the literal one you actually meant. When I wrote for the theatre, my work was often accused of having symbolism that wasn’t really there. Perhaps it is time to take that nonexistent philosophy and branch out into T-shirts. As for NaNoWriMo: GO GO GO! You can do it! I would TOTALLY wear that t-shirt! At least your muse isn’t in rehab — oh don’t ask! What, I’m not your muse? I’m shocked and disappointed. My muses have mental health issues — bahaha! You don’t want those ~shaking head~ Oh but wait a minute — you did wave at a squirrel, hmmmm… I’m totally inspired by that! I hate it when the cats try to eat my fish. Then again… The cats chase the herons and the fish have a fighting chance with the cat. I enjoy a good walk too. Clears the head. But nature is too beautiful not to be distracting. That’s nature’s job, I think: to distract you from life’s ills. I love trail running for the same reason – there’s something about being in nature and getting your blood flowing that seems to help stimulate creativity. p.s. Love the cute squirrel pic! Yep. Blood flow is the key. Stay in front of a computer too long and it’s like being in a coma. That sounds like a great way for resetting the dreaded blank page mindset (aka, The “Oh, Help, I’ve Forgotten What a Word Is” Disorder). I wish I wrote a little earlier in the day, though—when I need a squirrel-break, it’s usually too dark to see ’em. I do suppose you can go opossum watching. They’re not nearly as cute as squirrels, but at least they’re nocturnal. On the upside, cats can be found lurking about both day and night. Always have a rock ready. Or tuna. I’m just sayin’. Oh, you’re an enabler, eh? Yes. It’s hereditary, I’m afraid. That last line is awesome. I get two dog walks in every day and I don’t know what I’d do without them. It’s crazy town to stare at a screen all day. Shudders at previous jobs. My eyes are blurring as we speak. I need a walk and I’m gonna take one. Would you like me to give the squirrel a message from you? Wow – spooky/magic/coincidence/intuitive flash – take your pick:-) I prefer your title and the cute squirrel pic is a winner…what can I say, great minds think alike! yes, so neat, how you both wrote about inspriration and nature. Too great posts, written from two different perspectives. I loved both of them. Perhaps this could be a sort of a future blogger project. A bunch of us could choose a common writing topic (ie: rejection, queries, editing, etc.). Then we select an agreed-upon date to post about the topic. At the end of each of our posts we then provide links to other participating blogs. Mike, You’re not the guy who posted the squirrel obstacle course video on YouTube a while back, are you? It was very memorable, so, if it was you… thank you. Is that what you get up to when your muse takes a little siesta? Masochism or self-discipline, you’ve been getting things done. The proof is in the pudding. No, but I’ve seen it. Squirrels are brilliant aren’t they? I’m more of a “Come here little guy. Let me hand feed you.” kinda fellow. If you do, and one bites you, I might not be needing that kidney you offered. Here’s hoping you’ll never need a kidney. But it is nice to know one’s available, yes? “…nature distracts and annoys me.” God that’s funny. Thanks. Funny, but sometimes all too true. Two words: squirrel photobomb. There, I said them. And ain’t those words wonderful? You do know that squirrels are just rats with cute tails, right? I’m with you on the whole nature and creativity link. My most productive writing happens while sitting on the porch of our cabin. I go all Walden’s Pond. Your squirrel assessment is more or less accurate. But as I have two pet rats, this troubles me not. I can email you a photo of the little darlin’s if you want!. I can’t get beyond rats’ tails. Creep-o. Your loss, my friend. They are lovely animals. Please don’t hurt the kitties! I can’t help it, I’m a cat lover. But I also like squirrels very much. There were 3 squirrels who used to come visit my fire escape regularly. I named then Flossie, Percy and Merlin. Flossie was smaller than the others so she seemed girly. Percy was a tough guy, he had only half a tail. And Merlin was a big chubby fella with a magnificent fluffy tail. Sorry, Weebles. I am a defender of all things widdle and fwuffy who do that little nibbly whisker-twitchy thing. Also, I am horribly allergic to cats. But (sigh) you’re a friend. Tell you what. I’ll just chase the kitties out of my yard without making any attempt to murder them. I think that’s a pretty big concession, don’t you? I watched a squirrel for an eternity today (like 130 seconds) whose tail did not stop moving even though the squirrel was sitting still. Was it smelling the wind? Was it flicking flies? Did the squirrel have a tick he couldn’t control? I don’t want to be a bully, but that squirrel was a real weirdo. Oh, I love the tail twitchy thing! I could watch that all day. I always assumed it was a sort of squirrely semaphore. If that squirrel was trying to get a plane to land in my backyard, we are going to have problems. Someone once told me that if I wait for inspiration to sit down and write, I’ll rarely accomplish what I want. They were right. Now, I like you, sit in front of my computer till my fingers start to move. The thing is, now I can’t stop. I always have an idea, thought, opinion. It’s great. The more you do it, the more you do it. Indeed. Some days the words flow more easily than others, but I honestly cannot remember the last time I’ve been blocked. We are so fortunate. So many, suffer from writer’s block. Thanks, Created! I used to be a magnet for mosquitos, but I guess they don’t like old blood. So that makes nature these days a bit more pleasant. Congratulations on being Freshly Pressed!! my mind is so full of thoughts but it takes so long to jot them down in presentable manner! That’s why I do so love a walk in the woods. It helps me to find my focus. I can so relate to this except for the part of chasing feral cats. My dogs do that for me. :)) There’s nothing like a good walk to clear your mind and I find it really relaxing to the point that I can write easily afterwards. As I am not a dog owner, I gotta do my own dirty work. Thanks for visiting, Ms. Elf! Keep the pigeons, Mrs. Fringe. Otherwise, it’s a deal. Hey Mike! Congrats! I see this was freshly pressed. I was freshly pressed yesterday. Get ready for a wild ride! Wow. Crazy. Totally fun, but crazy! You have no idea how delighted I was to see you there on the WordPress homepage. I am not being faux humble when I say that you deserve the recognition far more than I. What I found (and find) funny is that neither of us were categorized under “writing.” I mean, come on! That’s all we ever talk about! I’d love to talk about this more off-WordPress. As I’m sure you are, I am buried. Geez! I can’t breathe from all the comments. Not complaining! I agree. I am part of “Traditions”? What heading were you under? I saw it and forget. Me deserve it more than you? I think not! Let’s talk later. I inspire people to throw rocks at cats. I, too, wave at the squirrels and the deer. I wave my fists and yell that they never offer to help pay the rent for using my yard. They don’t wave back either. Congratulations on being fressly pressed. Thanks, Curmudgeon! But do be careful. I just read a story in “The Week” about hunters being hunted by an angry buck. You don’t have to like deer, but do try to be civil. I’d hate to see anything happen to you. Glad I could give you a chuckle! Thanks for the visit! I was excited this morning to see this on Freshly Pressed. I hope it’s not too much pressure. Absolutely loving this. I HAVE to leave the computer when I simply cannot find anything to write, or create since my art muse is being a finicky little *insert not so nice word here*. I’m fortunate enough to have four humanized versions of squirrels. Apparently that is what happens when you have kids. You “think” you’re about to get this lovely baby (why do they call them bouncing babies? I’ve NEVER seen a newborn baby “bounce”!) and instead you find out you’ve delivered a larger version of a squirrel, minus the adorable fluffy tail! As for what that squirrel is doing while they twitch their tail and stay perfectly still otherwise… they’re attempting to hypnotize you with the tail twitching so you won’t notice they’ve just stolen every single worthwhile walnut from the ground around your tree! Thanks for your comment, Kathryn. You made me smile. You also made me think; children ARE a lot like squirrels, aren’t they? They most certainly are, especially when it comes to hiding away winter stores. Ever watch a child systematically stash Halloween candy away in little hiding places? Squirrels. Hi Mike, Nice digital picture of the squirrel! What type of camera did you use? No camera at all. It’s a copyright-free image. My friend found a squirrel once, he put it in a box and only have it cheese – I tried telling him he doesn’t eat cheese but he didn’t listen. After it got sick he realized it was a bad idea and let him go. The morel of this story is if you find a squirrel, don’t give him damn cheese. Words to live by, Gibberish. Thanks for visiting! I agree, I could spend all day in nature. Me, too. But when night falls, I prefer a proper bed. Camping is not my thing at all. So true – I am going through a period where I actually said I needed to chain myself to the desk, I am going to save some squirrels instead it sounds more productive. Thank you. Wonderful! And don’t forget to protect the bunnies, too! When I left my beautiful seaside home it wasn’t the studio I missed, it was my garden, the wild ducks,lizards basking in the sun,kangaroos. Now I yearn for a studio maybe it’s the squirrel I need to get me painting again. Cheers. The idea of looking out my back window to watch frolicking kangaroos seems like a kind of heaven. As a fellow lefty I was immediately impressed by your understanding of the lefty hand sweat/smear. Followed by the, “holy cow..he still uses pen and paper from time to time!” Finally I feared for your life because squirrels are like bears, adorable from a safe distance but up close those buggers can bite or at the very least carry unfriendly fleas. But waving is a safe alternative and feral cat chasing is probably the best way to get those creative juices flowing! 🙂 Congrats on the freshly pressed and more importantly super congrats on your book being published! You’re also not kidding about those rodents, they can deliver a very painful bite! My pet rabbit, now decreased, taught me a painful lesson to never stick my finger in their cage while they’re eating carrots. But I love squirrels, did you know they’re supposedly immune to rabies? 🙂 No excuse not to love the little guys. Thanks for your kind post, Monica! I am always delighted to welcome fellow southpaws to heylookawriterfellow. I have been in close proximity to many squirrels in my day, but have never felt frightened of them. Painful bites or fleas have never worried me. Perhaps I am a naive fool. Or maybe — just maybe — I am The Squirrel Whisperer. The squirrel whisper huh? I will be sure the send out my “bat/squirrel” signal next time I am surrounded by a scary looking pack of them…those nose twitches can be awfully intimidating! Its unfortunate how underrated nature really is. Indeed. A lot of people don’t know what they have until it’s gone. There are no squirrels where you live? I thought they were everywhere! Do forgive my ignorance, but what kinds of cute widdle furry rodents do you have over there? Our aim is to spread the love of Blogging and encourage achieving Bloggers to do their best, so keep up the brilliant work! Congratulations on getting Freshly Pressed, Mike! I love the picture of your squirrel. They were the bane of my mother’s existence at the cottage because she liked to feed the birds and tried everything she could think of to keep the squirrels out of the seeds. The trees in our neighborhood are finally big enough to entice squirrels with their ‘new condos’ so we’ve been seeing a lot more around here. Unfortunately, there have been a lot more squashed on the roads because they’ve dashed across at the wrong time. We used to have a couple of ‘hooded’ rats when we first got married. They were very affectionate creatures. They are long-since gone, but when the kids were little, we had a variety of mice and hamsters. Then my daughter cried about wanting a cat. I told her we’d get one when the hamster died. Darned little bugger must have overheard us and stubbornly stayed alive until the ripe old age of three! Our cat stays inside or on a leash when out, so he can’t chase the squirrels or baby bunnies in our yard. As for feral cats, don’t get me started on the pet owners who let their cats run wild and spawning with others until the broods are scary-wild. As much as I love the trills of songbirds, I have always been firmly in the squirrel camp when it comes to the two parties’ never-ending war for seed. As you know, I am unapologetically pro-rodent. In addition to my rats, I have also owned gerbils and a guinea pig. And your hamster story doesn’t surprise me at all; rodents are stubborn little buggers, aren’t they? Congrats on the FP nod. Not sure anything good can come from any animal that speaks with his mouth full though. I can overlook a squirrel’s table manners if it has something pleasant to say. Until recently I lived on property that included several squirrel AND chipmunk families. 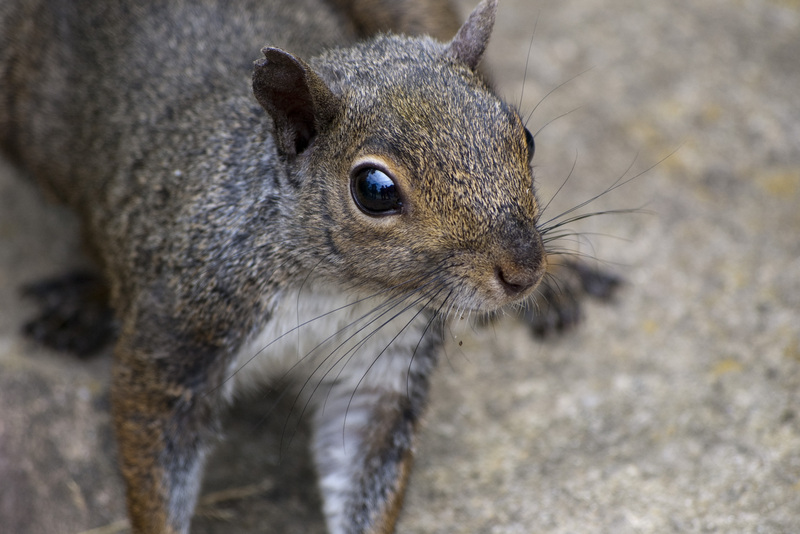 Although chipmunks are cuter (and have songs written for them), squirrels are smarter. Thus, when I needed inspiration with my writing, I sat on the back door stoop (where the squirrels gathered under the bird feeder to eat the seed that had scattered on the ground – told you they were smart) and I read my paragraphs out loud, editing or rewriting when they looked at me with disappointment, adding and embellishing when they smiled and nodded their heads. It was a win/win situation for all of us – they were entertained, and I had a perfect critique group. Try THAT the next time you want some squirrely nature. Oh, Pam, I always knew you and I were simpatico, rodentwise. Anyone who can write flash fiction about a capybara is — and always will be — a friend of mine. I’m the same way – nature distracts me from writing. It’s even harder now that I’m a chicken-momma, because I want to go peek out the window/migrate to the backyard every time I hear them squawking over something. Have you ever seen a chicken find a worm or a garter snake? The ensuing war with the other chickens is HYSTERICAL. But yes, stirring up the routine is so important to remaining creative. I also need to un-glue myself from the computer more regularly. Welcome, stranger! (Let’s just ignore that I have been equally remiss in visiting your blog, shall we?) Good to see you again! Ungluing from the desk is essential, isn’t it? I would assume, however, that your new chicken charges keep you from getting too comfortable in that office chair. We southpaws may have to live with ink stains all over our pinkie knuckles, but otherwise we’re awesome. Nice! Glad to see you enjoying the company of the squirrels! I love it when they take a peanut from my fingers….Well, for me, it is usually the chipmunks. I can spend hours out there with them! Keep enjoying your muse! College campus squirrels are the best for hand feeding, I find. When I was in school, one crafty fellow quite literally pressed his nose up against the glass door of the campus deli waiting for customers to come out. It was an adorable and slightly pitiable performance. It was an effective performance, too; the little bugger rarely walked away empty-pawed. Sadly I have yet to earn a chipmunk’s trust. I have not given up, though. I never will. Nature therapy works for me every time. I do wish I could get back to writing with a pencil and notebook, but dang…..the computer makes it so easy. I’ve gotten spoiled. I do almost all of my writing on the computer as well. I use a pad and pen for first drafts and idea generation. Your blog post made me realize something: writing IS like chasing a feral cat. Thank you for that! Congrats on getting “pressed”! I can often catch good writing ideas; the feral cats, however, have, at least so far, escaped my grasp. Yes…nature is lovely and distracting. How close was this squirrel to you? It looks like you and he are acquaintances? I am acquaintances with all of my local squirrels. All of them, however, are camera shy. This cheeky little fellow is from a free stock photo site. Nice stuff, nature has a way of solving natures problem i guess. Indeed it does. Thanks for visiting! You should work with Monroe shock absorbers on the “save the Squirrels” campaign. The furry rodents they have seemed very talented and are likely quite friendly and would return your wave. :} I can understand your feeling about writing in nature, there are so many distractions I really have not given it a try. You might be onto something, Joe. I’m givin’ Monroe a call. I love squirrels too… and nature. I just want to hug and squeeze squirrels! But they run when I get close. When I am having an artist’s block, going out in nature helps me too, clears my mind. Then back to the drawing table to work on that masterpiece! Check out my blog… I combine literature (Dickens) and art. Thanks for the inspiration! Ah, but the big questions is: Do squirrels wanna hug us back? I think they do! They’re just scared. “finding that feral cat that I oh, so wanna hit with a rock” or “feral cat chasing”. It is because of people like you that I volunteer for an animal shelter, fostering cats and dogs that have been abused by monsters like you. Well, thanks for stopping by! Stop. You’re making me blush. I’d love to pretend your comment is not a plug for your business, but you’re not making it easy on me. C’mon, buddy! You gotta be more subtle! This is my first visit to your blog. And, yes, I found it on Freshly Pressed. Congratulations! I am a cat, and dog, person but I truly love watching the squirrels. We live in the country and we have had three or four babies born and now big enough to run up and down the trees and all. I watch the babies from my kitchen windows while I cooking. They play in the side yard of our house. We have three cats – one inside and two outside. The outside cats have names but they really only come here for our food – which we put out everyday. They don’t, either one, seem to have any interest in the squirrels. As for writing, everyday I plan to write something. Not everyday do I succeed. And sometimes I start something and then lose my thought train and have to “draft” it to finish later. I love to write and have wanted to for many, many years. I love the idea of a nature walk for inspiration. Just getting outside for a little while is often all it takes to get those creative juices flowing again. I really enjoyed your story. Thank you for your thoughtful comment, Bigdreams! it sounds like you’re set up in a beautiful and inspirational area. I can only wish that someday I can watch baby squirrels from my kitchen window. It sounds like a great way to start the day! What kind of writing are you working on these days? I’m struggling with my writing right now but I keep trying. Then I trash it. Then a day or two, try again. Honestly, I think it’s a confidence issue but I do think this will pass. The holidays are not my best time of year – I love the celebration at church and the family part – just not all the hype. And that doesn’t even mention the disappointment that usually comes with expectations. You’re right, tho’. Watching the baby squirrels from my kitchen window at any time is a great way to lift my spirits (when I need them lifted) or to just smile. I saw a bald eagle the other day and was amazed. I had never seen one in the wild before and was just truly blown away. Never did get a picture of him tho’. Keep at it, Debi! The muse will visit again soon. Wonderful photo of squirrel up close. Thanks, but I can’t take credit for it. It’s a copyright-free image. I liked your blog and currently following it. I’m new to this blogging thing so can you help me improve it. This is the link to my blog. No, I like nature. It only gives me a problem when I write in it. I see…I like nature from afar. My wife calls me “The Great Indoosman,” so I can relate. Love your hoops, by the way! Tudo sobre à natureza é maravilhoso. I’m monolingual, I’m afraid, but what I understand is very flattering! Thank you! Mike Allegra. Feral Cat Chaser. Champion of Squirrels Everywhere. I feel like I should be posing on a mountaintop somewhere while my cape flutters in the breeze. This is really delightful and grand…”chaining myself to my desk…” I can identify with that. AHA!! Thanks for sharing your gift. Oh, my, gosh! My scrolling finger is burned out. Congrats on the Fresh Pressed. Hey, how does one get freshly pressed? I like squirrels and I like cats. I must say I like cats better else the two I live with might do something sneaky while I sleep. One already knocks the closest item on the floor if he doesn’t get the attention he wants. Needless to say, every fragile and important item is out of his reach. There is a little family of squirrels that live in the tree in my new backyard. I have no problem with that, but my friend, who lives next door and runs a dog rescue there is not thrilled with the “rats.” They actually run down the tree and across wires to antagonize the dogs. Pit bulls can have an amazing vertical leap. One pit almost got ahold of one of the squirrels–over a 6 foot privacy fence. The “rats” also start dog fights when two or more dogs all want to get at them. Nothing worse than a frenzied pack. But I do agree the fuzzy tails are cute.